The appearance of a ListView is dictated by the layout of the rows being displayed. To change the appearance of a ListView, use a different row layout. TestListItem – Single line of text with minimal formatting. SimpleListItem1 – Single line of text. SimpleListItem2 – Two lines of text. 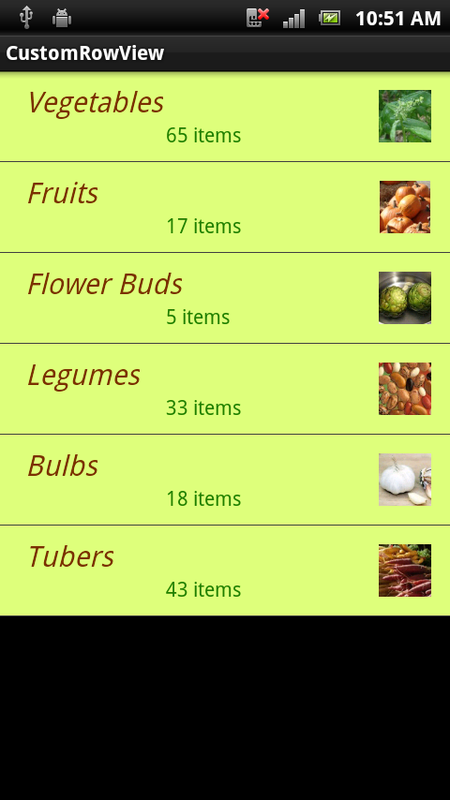 SimpleSelectableListItem – Single line of text that supports single or multiple item selection (added in API level 11). SimpleListItemActivated1 – Similar to SimpleListItem1, but the background color indicates when a row is selected (added in API level 11). SimpleListItemActivated2 – Similar to SimpleListItem2, but the background color indicates when a row is selected (added in API level 11). SimpleListItemChecked – Displays check marks to indicate selection. SimpleListItemMultipleChoice – Displays check boxes to indicate multiple-choice selection. SimpleListItemSingleChoice – Displays radio buttons to indicate mutually-exclusive selection. TwoLineListItem – Two lines of text. ActivityListItem – Single line of text with an image. SimpleExpandableListItem – Groups rows by categories, and each group can be expanded or collapsed. The properties for the group view and the child view can then be set by referencing the standard Text1 and Text2 control identifiers as shown above. The SimpleExpandableListItem screenshot (shown above) provides an example of a one-line group view (SimpleExpandableListItem1) and a two-line child view (SimpleExpandableListItem2). Alternately, the group view can be configured for two lines (SimpleExpandableListItem2) and the child view can be configured for one line (SimpleExpandableListItem1), or both group view and child view can have the same number of lines. 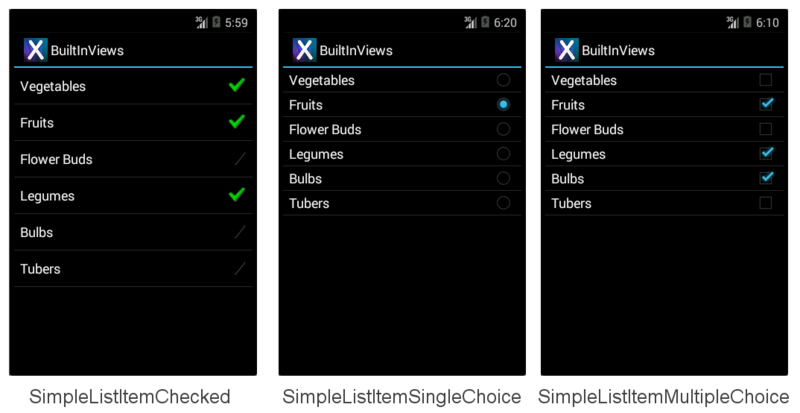 SimpleListItemChecked – Creates a single-selection list with a check as the indicator. SimpleListItemSingleChoice – Creates radio-button-type lists where only one choice is possible. SimpleListItemMultipleChoice – Creates checkbox-type lists where multiple choices are possible. 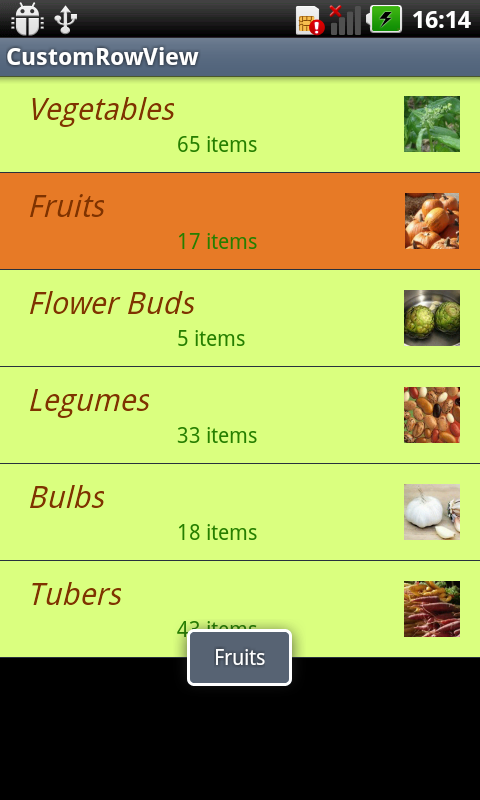 The ListView itself supports different selection modes, regardless of the accessory being displayed. To avoid confusion, use Single selection mode with SingleChoice accessories and the Checked or Multiple mode with the MultipleChoice style. The selection mode is controlled by the ChoiceMode property of the ListView. Earlier versions of Xamarin.Android implemented enumerations as integer properties. The latest version has introduced proper .NET enumeration types which makes it much easier to discover the potential options. Inherits from Activity , not ListActivity . You can customize rows for any ListView , however other controls can also be included in an Activity layout (such as a heading, buttons or other user interface elements). This example adds a heading above the ListView to illustrate. Requires an AXML layout file for the screen; in the previous examples the ListActivity does not require a layout file. This AXML contains a ListView control declaration. Requires an AXML layout file to render each row. This AXML file contains the text and image controls with custom font and color settings. Uses an optional custom selector XML file to set the appearance of the row when it is selected. The Adapter implementation returns a custom layout from the GetView override. ItemClick must be declared differently (an event handler is attached to ListView.ItemClick rather than an overriding OnListItemClick in ListActivity). These changes are detailed below, starting with creating the activity's view and the custom row view and then covering the modifications to the Adapter and Activity to render them. The benefit of using an Activity with a custom layout (instead of a ListActivity) lies in being able to add additional controls to the screen, such as the heading TextView in this example. While a custom row layout can contain many different controls, scrolling performance can be affected by complex designs and using images (especially if they have to be loaded over the network). See Google's article for more information on addressing scrolling performance issues. Android attempts to improve the performance of ListView scrolling by caching layout information. If you have long scrolling lists of data you should also set the android:cacheColorHint property on the ListView declaration in the Activity's AXML definition (to the same color value as your custom row layout's background). Failure to include this hint could result in a 'flicker' as the user scrolls through a list with custom row background colors.